This was a small United Methodist church1 located on the corner of the ramp, at the lower end of Grimshaw Lane, and Rose Bank. It was known as the ‘tin tabernacle’ because of its construction – timber frame clad with corrugated iron sheets which had been bought as a flat pack! It opened in 1887 and closed at the end of 1956, when the congregation merged with the Wesleyan Methodists at Knowles Green (Wellington Road) to become Bollington Methodist Church. 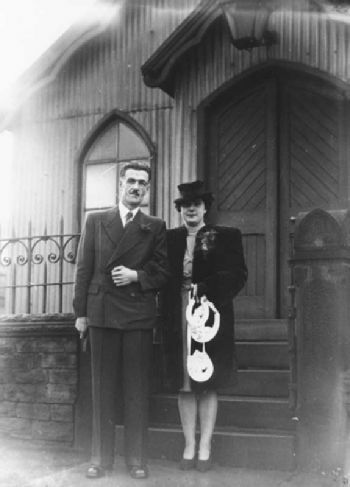 The only pictures we have are of an unknown wedding taken in front of the building in 1950. The groom has a striking resemblance to the infamous Lord Lucan! If you know who it really is, please let me know. Although named the United Methodist church, the congregation merged with other Methodist congregations into the united Methodists at the Wesleyan Methodist church in Wellington Road. 200 Years of Bollington Methodism Jean M. Wright, 2007, p.58. My thanks go to those who researched and discovered the history that is presented in these pages, particularly Jean Wright who has researched and written extensively about the Methodist churches in Bollington. Please read the full acknowledgement of their remarkable achievement.